People need to stop and think about the way we treat animals. 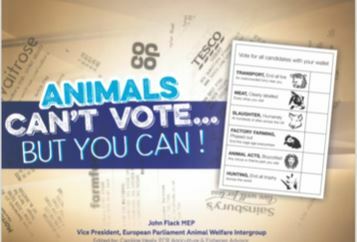 That is the message from John Flack, Member of the European Parliament for the East of England, who makes the argument in his newly-released, hard-hitting animal cruelty book focusing on the savage abuse of animals in agriculture, tourism and entertainment. The ground breaking book, titled Animals Can’t Vote…But You Can, takes aim at current contradicting labelling initiatives with a view for them to be replaced by a single clear and simple regime to let consumers know exactly how animals have been treated. Mr Flack, who is also Vice-President of the European Parliament’s Animal Welfare Intergroup, said: “We humans have the votes and the power animals lack. “Not just at the ballot box, but in choosing what we buy and eat, what we wear and how we entertain ourselves at home and abroad. “My book presents some hard-hitting snapshots of what is downright abuse by any civilised standards. “They are there to make people stop and think. I want to ignite something in people’s consciences and in their hearts. The book urges consumers to use commercial muscle to shun entertainment or spectacles involving animal cruelty and to eat only ethically-sourced food. The animal welfare book was launched at the Conservative Animal Welfare Foundation and Conservative Environment Network joint reception hosted by Zac Goldsmith MP at the Hyatt Hotel at the party conference on October 1 2018. Speakers included Ministers and MPs. Read John Flack’s introduction here: “Having written this book I feel I have achieved my goal and I am proud this has been recognised by my colleagues who have elected me as one of the Vice Presidents of the Parliament’s Animal Welfare Intergroup. A cross Party and cross nation grouping, one of the oldest in the European Parliament and dedicated to improving animal welfare. It is often assumed politically that, animal welfare is the particular concern of the left, be they Socialists, Greens or Liberals. It is true that I have found common cause with many good people from across the political divide, but there are also many Conservatives in the UK – as ably represented by the CAWF (Conservative Animal Welfare Foundation) who are just as passionate and dedicated. There are also numerous NGO’s that do sterling work and I list in the final chapter a few I hope you may be moved to learn more about and potentially support. 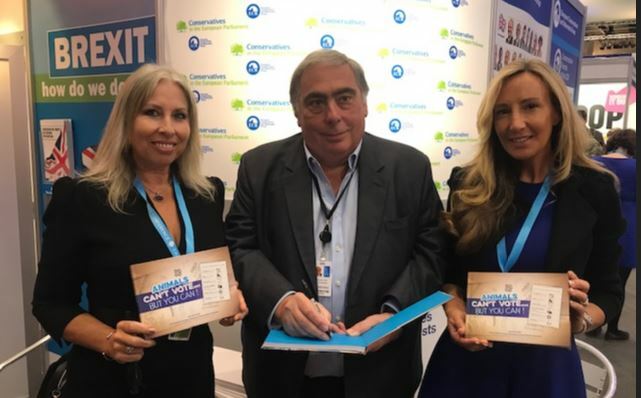 Photograph of Lorraine Platt, Co- founder of Conservative Animal Welfare Foundation with John and Elise Dunweber, Conservative candidate, former Conservative Councillor and the current Chairman of Esher and Walton Conservative Women’s Organisation since 2011.